Message from the IG Chair: How are we doing? Where are we going? In addition, the newsletter offers a series of announcements, including details on the SAP Community Day at EGOS, the SAP-R Workshop at Lancaster University and on a Special Issue of IJCA on “Accounting & Mgmt in Italy”. Check it out! 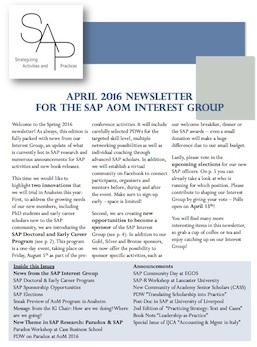 This entry was posted in SAP @ AoM, SAP Events, SAP People, SAP Research and tagged Doctoral & Early Career Program, Elections, Newsletter, Paradox, SAP Interest Group, SAP Research. Bookmark the permalink.